Gov. Asa Hutchinson’s chief of staff Alison Williams plans to draw on experiences from more than a decade ago as she oversees a plan to consolidate state agencies. Williams, who worked with Hutchinson when he was undersecretary of the U.S. Department of Homeland Security, said there were some valuable lessons learned as that agency ramped up in the wake of 9/11. Williams appeared on this week’s edition of Talk Business & Politics to discuss the governor’s transformation plan, which will consolidate 42 state agencies, boards and commissions under the umbrella of 15 cabinet posts. 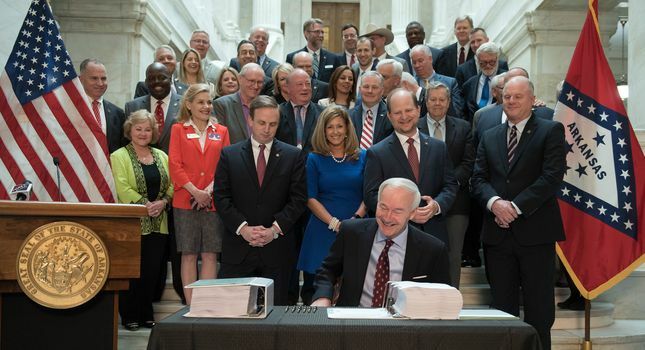 Hutchinson signed the massive 2,000-plus page bill into law this past week. “I think the most challenging [item] this session was the transformation bill, not so much for any policy reason or real concern about it, but it’s a lengthy bill. It’s going to be a legacy for the governor, and people wanted to get it right,” she said. Williams also said she expected the governor to coordinate with the Arkansas Department of Transportation and the state Highway Commission to develop a plan to pitch to voters as part of a permanent half-cent sales tax increase that would produce more than $200 million annually. The bill is part of a $300 million plan that Hutchinson lobbied for in the last legislative session, but don’t expect to see specifics for several more months. You can watch Williams’ full interview in the video below.